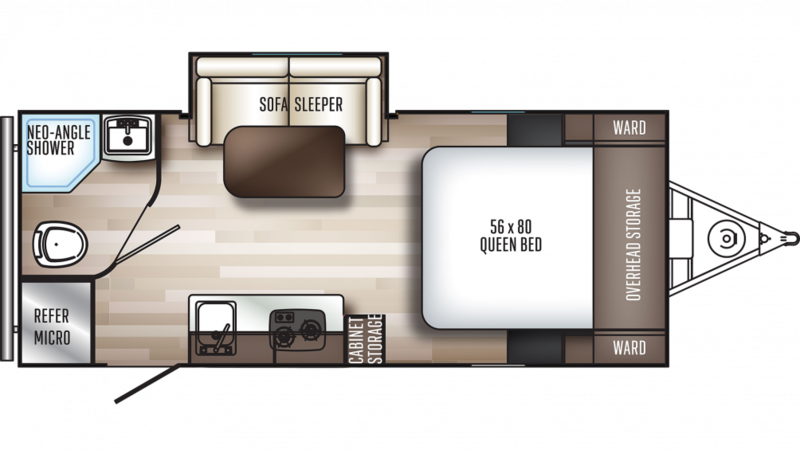 Bring home the 2020 Palomino PaloMini 181FBS Travel Trailer and save $1000s when you do! National RV Detroit has been selling the best RVs in the world in the Detroit area and beyond since 2008 at unbeatable wholesale prices! Come in today and let us help you find the perfect RV for your family! We're conveniently located at 44700 N I 94 Service Dr Belleville Michigan 48111. Don't live in the Belleville area? No worries. We offer personalized phone and internet service and 24/7 delivery anywhere in North America! So call us today at 734-439-3400 and we'll make your RV dream come true with a deal that will amaze you! The living area in the PaloMini 181FBS is roomy and comfortable and will accommodate your whole family! It's 21' 8" long, 7' 0" wide, and 9' 6" high! If the weather turns to bitter cold, you'll stay cozy and warm inside thanks to the efficient 20000 BTU furnace! And the modern 13500 BTU a/c unit will keep everyone cool and comfy on those sizzling hot summer days! The community bathrooms in most campgrounds are often cold, damp, messy, and crowded. Well, you can say good-bye to that unpleasant experience thanks to the full bathroom in this terrific RV! Enjoy a soothing shower, morning, noon, or night! Take advantage of the sleek, easy to use Foot Flush toilet! There's plenty of hot water to go around from the 19 gallon freshwater tank and LP tank capacity of 20 lbs! This RV also has a 30 gallon gray water tank and a 30 gallon black water tank.